Mexico’s Los Cabos is best known as a vacation destination where beautiful scenery, deep-sea fishing, upscale resorts and margaritas abound. It is also an area full of hardworking people navigating multiple challenges. While tourism is the main revenue source, some livelihoods in the formerly quaint fishing village have been marginalized. The population has grown since the 1970s, when the Mexican Federal Highway 1 was laid down, allowing for smooth vehicular sailing between Los Cabos down south and Tijuana up north. It was convenient but mixed blessing. Although the new industry brought potential jobs and prosperity, participation required a new skill set: competency in reading and writing, some English, and adaptability to previously inapplicable modernity. I embarked on a Helping Hands Tour a day after my arrival. The tour, which operates regularly, introduces visitors to the organizations supported by donations made to the Solmar Foundation. This charitable organization was created and is run by Grand Solmar Land’s End Resort & Spa, my hotel and host for the weekend. 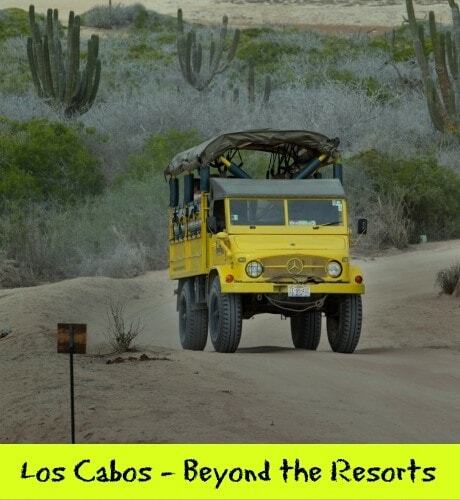 For me, the tour also functioned as an introduction to the “real” Los Cabos away from the perfect world of the resort. The social problems of the area were tangible. Heading north, roads in disrepair and boarded up businesses became more prevalent, as did houses decorated haphazardly with spray paint. Visually, the area appeared far less run-down than my hometown Detroit, but it clearly wasn’t courting tourists. 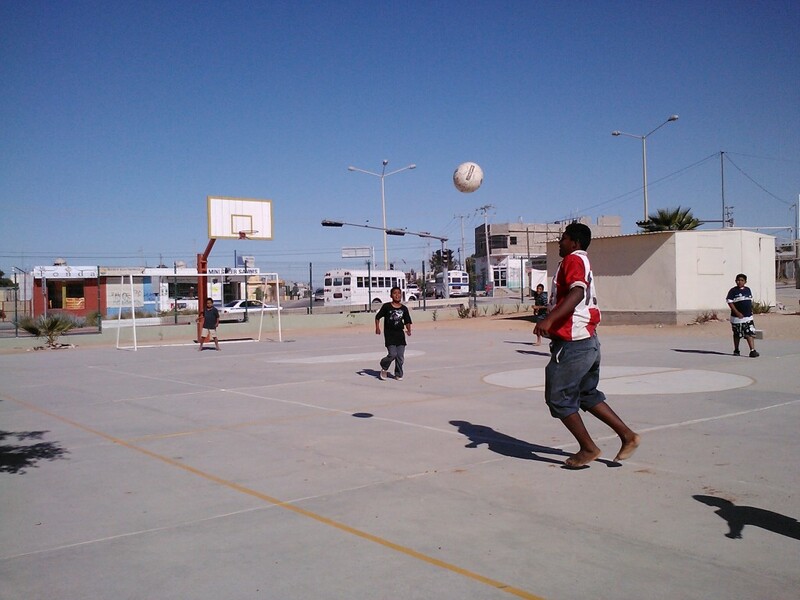 We began at a shelter for battered women supported by the Solmar Foundation. At the facility, women and their children are given food, lodging, and supplies for their post-shelter lives. Their stays at the facility are limited to about a week, and the waiting list to get in is huge. There was a bountiful reserve of supplies at the shelter, many provided in tandem with the Food and Basic Supplies Distribution Program, known as DIF. 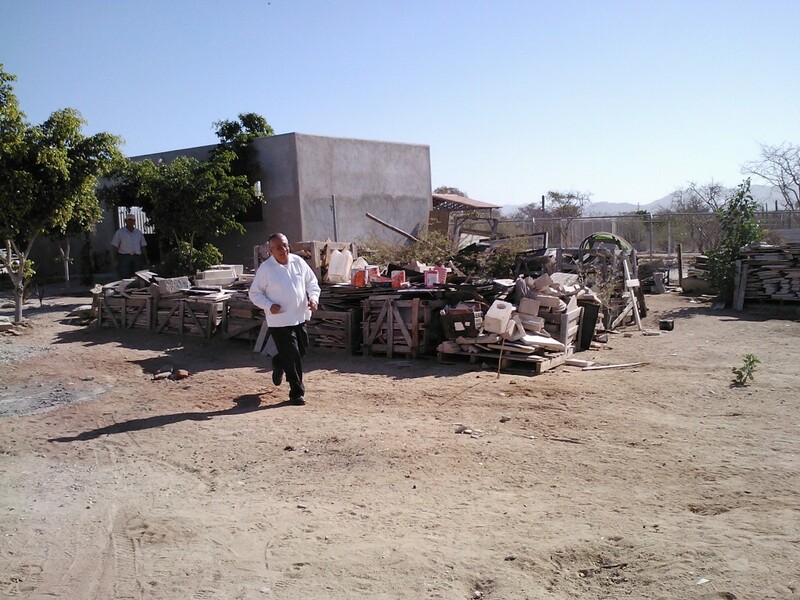 Because many of these families are homeless and live in the mountains, supplies are rudimentary: sections of torn cardboard, slabs of sheet metal, and broken wood are the prime offerings. Yet the mood was upbeat; the elder volunteer who doled out the stash greeted us by jogging over and shaking our hands warmly. Returning to Grand Solmar Land’s End Resort, I felt somewhat uneasy about enjoying such opulence after witnessing such hardship during the Helping Hands Tur. That morning I had met some devoted, strong families enduring considerable difficulties, and in the afternoon I was casually enjoying a luxury they might never know. That evening I walked with my new-found travel-writing friends into downtown Los Cabos, where we found that nightlife for visitors exists within a space confined by the landscape. The mountains provide a backdrop and development area for resorts, while accessible ocean terrain is crisscrossed by boat marinas and docks. In between spaces occupied by restaurants and bars were independent merchants, many of them selling local jewelry, clothing, and musical instruments. The goods often reflected the unique aesthetic of Los Cabos, colorful and dynamic. El Arco de Cabo San Lucas. Photo Credit: Grand Solmar Land’s End Resort & Spa. 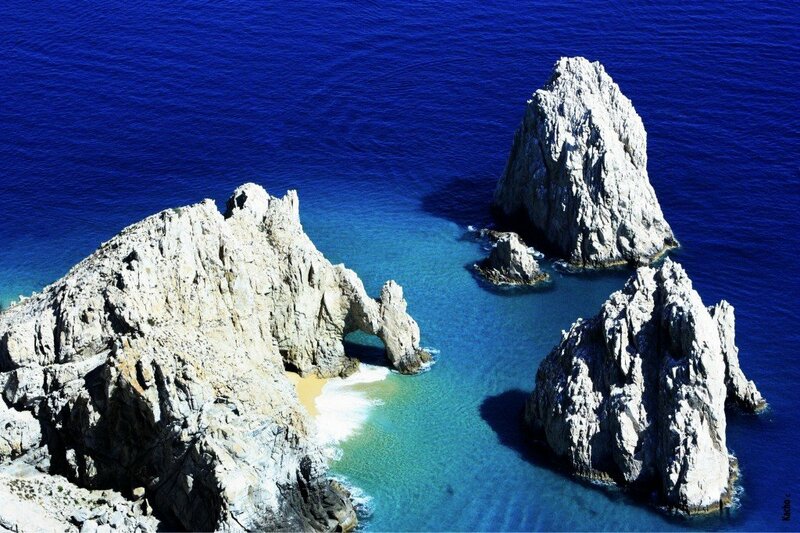 Los Cabos is defined and sustained by the Pacific Ocean. Since its formative years as a fishing village to its current status as a beloved tourist attraction, the ocean has been the pivotal player. On the morning following our night of frivolity, we motor boated on the Pacific Ocean for some dynamite experiences. Our first stop was the El Arco de Cabo San Lucas, the famous natural structure of rock arch surrounded by only sea. Sea lions did their part to enhance the scene, although their services weren’t needed—the mysterious space all around the arch was downright transcendental. At a spot barely removed from El Arco, we strapped on flippers and goggles, bit into some snorkels and slunk into the sea. After a few minutes, I swam away from the group, towards an area where black rock jutted out beside bunches of coral, and small waves broke. Snorkeling near El Arco de Cabo San Lucas. 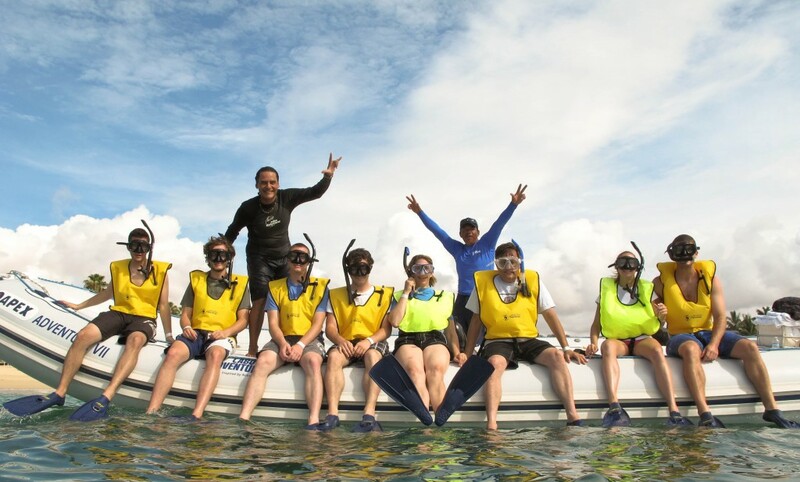 The scene underwater was pleasant, but in terms of snorkeling quality, it held no candle to what’s available in the Caymans, The Bahamas, or even Hawaii. In such beautiful Mexican surroundings—with crackling dry heat and sun that lit up small reefs—it was surprising to find a rather lackluster array of trumpetfish, clownfish, and sardine-esque pescado. Los Cabos is a deeply worthy destination. My interactions with natives outside the tourist zones were brief, which is perhaps regrettable. But as tourist destinations go, Los Cabos sure felt less “touristy” than most, and even the most jaded will find enjoyment here amid its stunning natural beauty and among its gracious residents. A Note from The Philosophical Travel Daddy: My visit to Los Cabos, Mexico was hosted by Grand Solmar Land’s End Resort & Spa. All opinions are my own, as always. Sounds wonderful. I love that your experience was a mix of what is truly local with some wonderful pampering as well. Quite true, Amber. “Pampering” and local culture don’t always mix easily, but during this trip to Los Cabos they got along well. I’ve never made Los Cabos a priority trip itinerary because it always seemed like a touristy, resort only place, but it looks like you can get away from it after all. It’s interesting to hear that you didn’t find it particularly touristy. I’ll have to give Cabo a second look next time I’m planning a trip. Darla–It’s definitely NOT a way to experience the breadth of Mexican culture. Still, taken for what it is, it’s better than most “touristy” zones. For one, it’s beautiful, which distinguishes it from many other spots that draw tons of tourists. It’s also not noisy or tacky like some party destinations, and surprisingly quiet. Some of this probably reflects Sandals’ dedication to keeping it tasteful, though I didn’t see anything obnoxious outside of Sandals either. I was in Cabo with my kids and my husband. Cabo is a great place to vacations. The food and the service was great. Mexicowas a great experience for Us. Thanks for share this info and remind me about it. Sure Pat! It’s easy to have a good time there.